Thanks much to Tempus Dictum for taking the plunge and buying the first ad on Beervana. As intended, I know nothing about Tempus Dictum and didn't, until they bought this space, know they existed. But I am appreciative to the company for sparing me from having to look at that "your ad here" spot on the blog for another day. Thanks! Oh, and while we're doing blog business, I should mention that I've tightened up content moderation following a massive hit on the site last night. I've previously had moderated comments for any post older than 7 days; I ratcheted it back to three. I'll relax it if things settle back down. Beer Labels: Normalization of Maleness and Whiteness? Excepting the daguerreotype-esque Southern Ale, all of the men above are shown enjoying the beer, usually while engaging in their daily duties or in making the beer. The cottonwood man is not actively engaged, but he is holding the wheat that will make the beer, thus conferring involvement in the beer on him. The Highlands man is somewhat othered by the bagpipes, and I’m not sure how the man in the Rogue ale is constructed, but both are drinking and enjoying the beer they’re intended to represent. 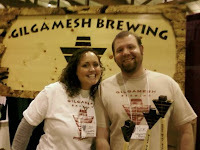 They are active and involved – not passive, not just drinking the beer, not just there. They are constructed as dynamic and effectual as they drink the beer. And they are all white: men of color are erased in beer packaging as far as I’ve seen. Let's start with the obvious: beer is a European drink. If we looked at packages of prepackaged Indian food, we'd see a lot of ... Indians. This hardly suggests that men of no color have been erased. In her photos--which you should click through to study--she offers two examples that are nods to the country of origin for the beer (Scotland, Ireland), and a third is, I believe, King Gambrinus. One is Rogue's socialist, one is a silly pirate cartoon, and three more seem to harken back to American colonial brewing. And so on. I do lament the whiteness of craft beer, though. Although Rachel's examples aren't perfectly illustrative of her larger point, I think it's clear that craft brewing is overwhelmingly white. When I go to pubs and beer fests, they are even more disproportionately white than our already-white city. How one works to change that isn't exactly clear, but I'm not sure packaging would affect it overmuch. When I saw this article about beer growlers in the New York Times, my first instinct was to mock. Isn't that cute?--the Times just discovered them. But after actually reading the article, I see that it touches on some issues I hadn't thought about--like how useful a simple (and old) technology is in a densely-populated area like New York. And how this may be a huge boon to consumption. I enjoyed the whole article; you might too. Go have a look. For the first installment of the brand dissection series (introduction here), we turn to Rogue Ales--the original inspiration. Yet it makes sense to start with Rogue in any case, because no other brewery in the Northwest has had such a consistent sense of its own brand, nor been more focused on maintaining their brand. This shouldn't be too surprising. Jack Joyce and other founders of Rogue came from the shoe industry and their focus from the start was to build a brand around their new brewery. Here's Rogue President Brett Joyce, whom I spoke to for this piece. "Understand that we began with our founders being a handful of ex-Nike and Adidas executives. So we didn't come into this thing with any experience at all in the beer business.... We always looked at the the brand first, the brand second, and the brand third--and the business fourth; the business as a secondary item. We always had the notion that if you have a great brand--and you have a great product--then your chances of succeeding as a business were pretty good." Although Rogue started in Ashland, the name isn't an allusion to the Rogue River (although Brett did concur that this gave it a nice resonance). It was actually a nickname of Jack's, earned when he was still at Nike. It seemed like a good fit for what the company wanted to communicate: Rogue Ales would be a beer-business revolutionary, effectively kryptonite to cheap beer. From the start, they have highlighted everything that contrasts with national tin-can beer: a focus on beer geekery (stats on the bottle), the best ingredients (which led them to buy crop land for hops and barley), a sprawling variety of products (as opposed to sameness of national brands), and emphasis of rarity and luxury. Even the "Ales" in the name underscores this point, highlighting the focus on ales, but also placing the revolution in the bottle, not in the company HQ. I view Rogue's self-image as one of a pirate ship careening around the country, trying to set its flag in the deepest reaches of Bud country. Rogue communicates their brand through several modes. Visually, you could call their presentation "luxurious revolution." The cues here seem to conflict, but keep in mind that the revolution isn't about politics, but about the beer biz. Sometime in the past decade or so, Rogue shifted their design to highlight the revolution through overtly socialist/communist symbolism. The art style is socialist realism, popularized during the cold war when the Soviets used art to support the revolution. It tends to focus on the strength and glory of the worker. Rogue, using these themes, features a variety of muscular men on the labels--a nod to the steel workers and farmers the Soviets employed. But Rogue doesn't stop at allusion. They also incorporate overtly communist symbols: the red star and the upraised fist. The star appears everywhere, and if you look carefully, you'll notice that it's always the left fist that comes up--a particular Trostkyite flavor. In addition to the visual cues, Rogue has always priced their beer above most other brands--another symbol of the beer's status as a rare luxury. Nike has been famous for this strategy for decades, and it seems to have been part of Rogue's from the start. In the context of the communist iconography, this seems strange, but of course, Rogue's revolution is aimed at cheap beer, not the Man. The final element of the brand is the idea of "Rogue Nation," which takes a page from the political branding playbook. As politicos know, it's a lot easier to run against a candidate than a movement. With Rogue Nation, the company has pretty effectively given their brand a movement component. With "citizenship," customers are offered a variety of insidery benefits which, not surprisingly, go to underscore the brand. Customers are fickle; citizens are loyal. With Rogue Nation, the company is saying, "Come board our pirate ship!" Rogue's been around 22 years. It's hard to sustain a revolution for decades; pirates can only stay on the outside so long before they get absorbed. In the past few years, we've seen some local blowback to the brand. In a part of the country where there are so many craft breweries, so many alternatives to tin-can beer, Rogue's revolution doesn't seem so unique. The beer prices are high and in the proliferating pubs, they're even higher. Everytime I post something about Rogue, I get about equal parts resentment and admiration. My sense is that this is not nearly the case in other parts of the country, where Rogue is an exotic visitor--but it is still a concern for a company that very much wants to be a successful national brand. I will also tip my hat to their work on the Green Dragon. For a company so strongly branded, it must have been murder not to Rogue-ize the new place. While it's true that the food is less spectacular and more expensive, I find it remarkable to see a company bury its own identity in order to create something new. As one contrasting example, when Starbucks bought the far superior Torrefazione Italia, they could only manage to preserve Torrefazione's identity for a short while. Within months they had turned these outlets into bland, mass-consumption Starbucks. That Rogue is willing to experiment and try extending its reach beyond its immediate brand seems to bode well for their future success. Since I know a number of people will be reading this who have experience in both the beer business and in branding, I look forward to hearing your take on Rogue. What'd I miss? 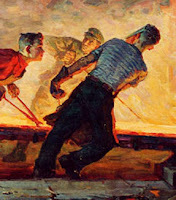 ART: detail "Young Steelworkers," Ivan Bevzenko (Ukraine), 1961. Courtesy Marxists.org. Hoping to tap a whole new customer base, the fast food chain has unveiled plans to peddle beer alongside their famous burgers at something they are calling a Whopper Bar. The first one is opening in Miami Beach and will target thirsty tourists hitting South Beach, Burger King confirmed. The chain is also reportedly looking to open more Whopper Bars in other tourist meccas like Times Square, as well as Las Vegas and Los Angeles. Don't look for exotic brews - BK is starting out with domestic brands like Miller at Budweiser and will consider other beers down the road. Does offering a Bud Light make a quarter pounder more attractive? Not to me. Still, a development worth watching. Something's happening in the Gorge. It's going to be a long time before any region can match the Seattle and Portland metro areas for good beer, but the Gorge may be the best stretch in rural Beervana. When Double Mountain opened a couple years ago, it began to tie Full Sail and Walking Man together as a distinct beer region. (Hood River also has Big Horse, a notch below these others in ter ms of beer quality, but a beautiful place to enjoy a pint.) Those are three of the Northwest's premier beer geeky breweries. Late last year, Everybody's Brewing opened across the Columbia from Hood River in White Salmon. 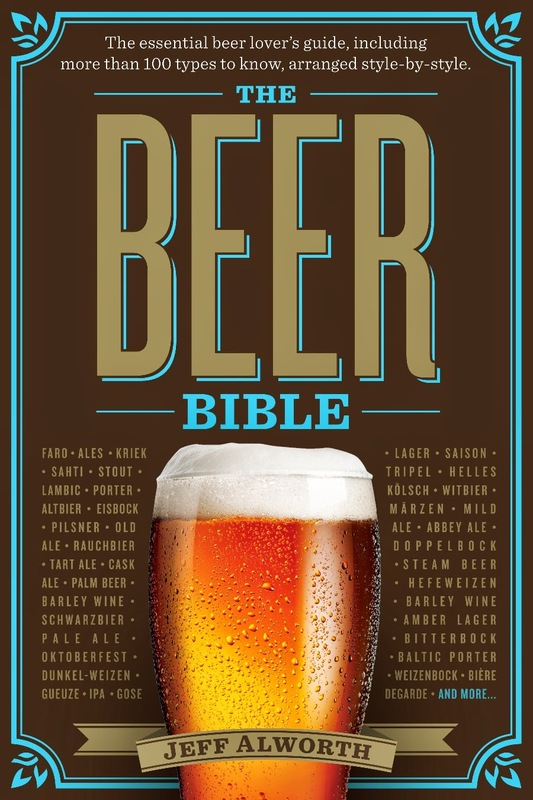 And based on the beer I had on Friday, we may have to add it to the list. White Salmon, for those of you who haven't driven across the bridge, is not exactly like its southern neighbor. Hood River reminds me of the towns that dot New England--a picturesque little downtown of well-preserved buildings and very little in the way of modern intrusions (McDonald's, strip malls, etc.). White Salmon, by contrast, is smaller and more hardscrabble. It looks like other cities you find along the I-84 corridor. It's a town where most vehicles are trucks, and most of these are hauling something. In other words, not the most likely location for an ambitious "small- to medium-sized brewpub," as Everybody bills itself. But hey, this is Beervana, and we have breweries even in unlikely locations. Their beer list is a typical of a Northwest brewery--mostly English-style ales, but stronger and hoppier, as is our custom. One interesting deviation is a super-hopped steam beer (aka California common). The beer I tried at Eastburn was their Country Boy IPA. You can both tell a lot and very little about a brewery by tasting its IPA. On the lot side, you can tell whether or not the brewer has the chops to make a credible offering in the most common style. On the little side, if it is credible, it doesn't exactly tell you much about what the other beers will taste like. Country Boy was an impressive beer, though, so I'm excited to try more. Everyone knows what an IPA tastes like, so a brewery must figure out a way to make theirs stand out. Country Boy's is resinous and woody. I'm not sure how they pulled this off with Centennial, Amarillo, and Cluster hops, but they did. It actually tastes like it's been aged in oak, so woody is the quality. It is also quite dry, which, when combined with the woody resin, makes it come across like a refined, almost austere beer. Definitely a nice showing for the first beer out of the gate, and on par with Walking Man, Full Sail, and Double Mountain. Whether the other beers meet this standard remains to be seen. Color me hopeful. Style of the Year--Oyster Stouts? There used to be this phenomenon in Hollywood (could be there still is) wherein two studios would simultaneously get an idea for a movie so that you'd see two, slightly different takes on a similar subject. Oregonians may recall the year of two Prefontaine movies. I notice a similar phenomenon in brewing--certain styles pop into vogue. I have no idea why this happens in Hollywood, but given the level of interaction and camaraderie in the brewing world, it isn't so surprising with beers. The only part that required a good bit of thought was how to incorporate the oysters? In the end we decided to add roughly ten gallons of oyster "liquor" that Jason picked up fresh from the coast off a train. We didn't want to brew an oyster stout without any oyster meat though so we also picked up eight dozen DeCourcy oysters from B.C. and cooked them during the kettle boil. After eating all the wort-soaked meat we cleaned and saved the shells to add later to the beer, post fermentation, like dryhopping. Oyster Stouts were quite common a couple of hundred years ago. I first made this beer while working at Bill's Tavern a few years ago and the research I did at the time did not give me a very good idea of a process. I couldn't find any readily available commercial examples either. Descriptions of the beer varied from a nice stout with no discernible oyster character to a very briny flavor. My attempt at Bill's Tavern created a nice robust stout without much oyster evident. It did completely screw up my wort chiller with little shell flakes clogging everything up. I had to back-flush several times during knock-out and then strip the whole chiller down. Our attempt here at Fort George used the same technique of putting two bushels of whole, live Willapa Bay Oysters into the hop-back (they were scrubbed very well on the outside first) and running all 8 1/2 bbls of beer through them. We made this beer on the evening of our Seafood and Belgian beer brewer’s dinner in hopes we could use them as hot appetizers, but after eating a couple they turned out to be too bitter for most palates. We were much more careful to not get oyster shell in the chiller. I have yet to sink my teeth into either of these beers, but I'm looking forward to it. I may even have to make a road trip if Fort George isn't sending some our way. In business and marketing, there's this concept of "brand." As the American Marketing Association defines it, a brand is a "name, term, sign, symbol, or design, or a combination of them intended to identify the goods and services of one seller or group of sellers and to differentiate them from those of other sellers." The idea of branding has evolved over the decades so that now it is suffused with cues to provoke emotion and loyalty, sometimes below the level of conscious thought. There is a obviously a crass element to branding. It can become so dominant that a product hardly matters; people are buying a brand as a matter of personal identity. When this happens, companies are no longer competing with each other over making a better mousetrap; they're trying to make better ads. Branding can be used to deceive; advocates of the environment are constantly shooting down false branding by companies trying to "greenwash" themselves. As a result, marketers and branding experts are slightly less trusted than third-world despots, lawyers, and used-car salesmen. But there's also something unavoidable about branding that is anything but crass. In a very real sense, brands are the personalities of companies and products. Companies can either highlight their great size (Budweiser) or their small size (micros). One may talk about its ubiquity (Coca-Cola), another about its exclusivity (Gucci). They may also be an expression of company values. Apple, with its every hip ad and product, suggests that it takes art and design seriously and is a product for people who agree. Would Bud be the King of Beers without its brand? There were other MP3 players on the market; why did the iPod become the standard? I was thinking of this as a result of a comment flagged by Patrick Emerson in that long interview Ezra had with Brett Joyce of Rogue. In it, Joyce professed ignorance about the economic concept of "signaling." I have no doubt he was as ignorant of it as I was before reading Patrick's description--yet that doesn't quite tell the whole story. Rogue is easily one one of the most branded beer companies in Oregon. One could make the argument that its brand is clearer than any other craft brewery in the country. Joyce may not understand signaling, but Rogue knows branding. If you look around at the major breweries in the Northwest, they all have pretty specific brand identities. These are rarely discussed (to suggest that something as base as "branding" would be practiced by homey, punky small breweries seems blasphemous--that's Bud's schtick), but they are nevertheless a serious part of the business now. And more than that, these identities shape how even astute consumers like you and me make decisions. We're no more immune to these subtle cues than we are to the personalities of the people we meet. So often, the comments I get on this blog express, at least in part, an appreciation of or opposition to a brewery's brand. In the next few weeks, I'm going to look at some of our breweries and dissect their brand. I find all of this fascinating. Like any other beer geek, I have certain idle fantasies about owning a brewery, and this usually manifests at least partly in thinking about how I'd present myself. (Ask me about the labels for my "Old Codger" Old Ale.) Branding can be crass, but we live in a wonderful little moment where craft brewers can't sell bad beer. They compete over product, but they also present a personality. I confess I'm so enamored with employee ownership that my hand often reaches for a Full Sail (suggested delightfully by that little "47" on the bottle). So let's have a deeper look. What are the breweries telling us with their brands? Since Rogue started it all, I'll begin with them sometime this week. Off the Southern coast of Sweden in the Baltic Sea is the island of Bornholm, which is actually a part of Denmark. On this island lives a woman named Anita, who is a friend of my friend Joe, who visited the US last summer. Also on this island is a brewery called Svaneke Bryghus, which makes an impressive range of beers. 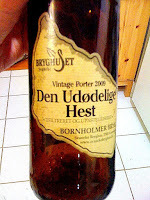 And one of these beers, Den Udødelige Hest ("The Immortal Horse" vintage porter), came in Anita's luggage to Oregon. Last night we cracked it open. Beer is local. Even as Google Earth and globalization shrink the planet, beer remains local. It is brewed of ingredients familiar to locals, in styles palatable to locals and appropriate to the weather of local areas. When you hold a bottle of beer in your hand, you may well hold a map that tells you about the agriculture, history, and beer culture of the country where it was brewed. Last night, when I inhaled the peaty rich aroma of Bornholmian porter, I tried to imagine the island. The beer itself is smoky and thick, a hearty stew to fortify one over long, cold Denmark winters. Nothing on the bottle was written in English, and as we drank the beer, we could only judge it by what was in our glasses. I imagined the icy Baltic Sea and seaports and the chill made me want something warming--with the scent and resonance of fire. I could imagine settling down with a pint of Den Udødelige Hest after a day in this cold, and it seemed like the perfect beer. Based on a Swedish folk song about stonemason Kalle Wahlgren who has to get drunk in order to kill his horse to put it out of its misery. But he doesn’t succeed: the next morning the horse is still there – alive and well. In a similar, manner our Vintage Porter is hard to put down. Well-hopped, a high alcohol content and unpasteurised, it will keep till well beyond the beyond. It’s got “whinny”. Bottom-fermented. 7.2% by volume. I couldn't taste this myth in Den Udødelige Hest--not quite. But I could taste something foreign, something unlike I've tried in the US. It was a place beyond my ken, a place that has already fired my wanderlust. I hope to someday try the Immortal Horse in situ and see how well it suits me there. "I went to Houndogs on Milwaukie for lunch. The special was a burger and beer for $3.75. I asked about it, thinking it would probably be a PBR or something but no. It was any pint on tap. So, for $4.50 I had a 1/2 pound burger with cheese and a pint of Obsidian Stout. My day has been improving ever since!" Where is this Houndogs, and why don't I know about it? I was out carousing in Sellwood the other night and noticed that venerable watering hole Terry’s Inn (4463 SE Milwaukie Ave) has reopened after being shuttered for two years. As longtime lushes can attest, Terry’s, a comfy dive that had been serving up Hamm’s and Budweiser since the Eisenhower administration, was a veritable wonderland of weird, kitschy decor. These are the kinds of things unemployed bloggers need to know about. But is it a craft brew? If this turns out alright, it is possibly the first ever cask-conditioned Belgian Cascadian Dark Rye ale ever produced in a commercial brewery. Who knows. Now we expect breweries to be able to brew to style. We're looking for novelty, something fun and different. Brewers, too, enjoy novelty (if for no other reason than it gets people like me talking). It's definitely a good time, though not a predictable one. Whether Ted's experiment will work is another matter. That Ardennes yeast is tough to work with. But from the many misfires or noble efforts, a few truly spectacular beers are bound to emerge. And with them, possibly, the styles of the next generation. The honor [of being the namesake of Younger's Special Bitter] goes to William, his late brother, who pulled Younger out of a corporate marketing job and into the bar business a generation ago. Corporate? Marketing job? It’s tough to imagine. In addition to his hippie-meets-blue-collar long hair and beard, Younger is perennially clad in jeans and a T-shirt. More important, as even friends will admit, he’s kind of a crazy coot. But it was only after an ill-conceived transplant to Los Angeles (when his employer relocated its headquarters) that Younger’s brother persuaded him to give it up for the bar business. “I was really a rising star, but I couldn’t live down there, driving an hour each way to and from work,” he recalls. Of all the "American"-style beers now brewed, the oldest is perhaps still the most American--the humble pale. The landmark beer--and still one of the most important American beers ever brewed--was Sierra Nevada's Pale. (Shockingly, that beer celebrates its 30th anniversary this year.) Many of the early beers in the craft revolution were forgettable, but SN Pale was a fully-formed masterpiece. It pretty much created the style. Unlike English pales, it has a soft sweetness lacking the sulfur or minerals of the originals and of course, that fresh, citrusy hop character that made Cascades the signature spice in American craft brewing. But at thirty years on, is it a style that still has legs? Both Deschutes and Pyramid think so; their spring seasonals are both pales. For Pyramid it's a beer called "Fling," and for Deschutes, that re-booted Red Chair, now dubbed a "Northwest" pale. It's no longer possible for a brewery to make much of a splash with a Cascades-hopped pale. Even if its absolutely saturated in Cascades, it will seem like a familiar pour to most beer drinkers. Yet the style is always going to be popular because it really hits us in the sweet spot--a light(ish) session beer that has that characteristic NW/West Coast tang. A good pale is a wonder to behold. So, how did Pyramid and Deschutes do--splash or flop? Let's start with the beer most of you know. My only experience with Red Chair was at the brewery, months before it was released in 22s. It was one of I think three IPAs on tap that day (and possibly four, but I'm an old man and these details drizzle out my ears), and not my fave. Sometimes you revisit a beer to find that you had mistaken it the first time, but nope, this is what I remember. A beer many characterize as somewhere in-between a pale and an IPA, it is definitely milder on hops than most regional IPAs. But I find it generally muddy. It's thick and chewy, with malt notes that smell bready but tend toward candy (rather than caramel) sweetness. The hops don't pop--they're vaguely citric and piney, but exhibit little character. It's by no means a bad beer, but not a memorable or distinguished one. I wonder if this isn't an IPA made more for the non-Beervana market. Scanning through the comments, I see that someone in Ohio declares it "laceratingly" bitter. Yet some of the NW types find it subdued, as I did. All taste is local, right? Give it a C+ on the Beervana ratings scale. Buckeyes, you're on your own. But in a glass, all ale is naked and unaided by clever design departments. And in the glass, Pyramid is ... surprisingly tasty. Fling employs Nugget and Willamette and XP-04188, which is a Cascade/Fuggle hybrid*, to great use. It goes to show that you can get a great deal of hop flavor and character while still having a relatively low level of bitterness (36 IBU). Yet the hopping here is not exactly subtle. It is unexpected--soapy, astringent, tangy. It actually reminds me a bit of the mineral quality you might find in an English pale. Insistent, distinctive--nice. When I cracked the beer, I was really expecting something light and harmless. I was also wondering why Pyramid would be releasing this now, in the chill of January, rather than later in the spring. Now I get it--this beer was meant to stand up to the late winter. It's interesting, this beer seems to have provoked Angelo to go on a rant against Pyramid, but I really like it. (I'm right; Angelo's crazy.) Call it a solid B+, maybe even an A-. It's still possible to make a splash with a new pale. A "Northwest" pale ale? Jury's still out. *Not to be confused with the X-114--or Citra--used by Widmer and Sierra Nevada. That one was largely Hallertau Mittelfruh (50%), US Tettnang (25%) and Brewers Gold (19%). SA: ok. Let me go into the Honest Pint project promoted by Beervana (jeff alworth). So awhile back you guys did a video of you pouring an honest pint but it didnt quite meet the qualifications because an honest pint actually has to be 16oz of liquid not including the head (their was no head on the beer in the video), is their any reason you guys opted not to go that route? Brett: In my experience what are called cheater pints are the pints that look like a pint but have the nub in the bottom so they dont hold 16oz. That was always my interpretation of what a cheater pint was. A pint glass that doesnt hold 16oz, now their is this new alleged definition that you get 16oz of liquid so that means you cant have a normal 16oz pint and have a head on it and I just think, if by somebodys definition their not honest pints then thats fine, you know 95% of the bars in the world use 16oz pints. We have served standard 16oz pints since day 1, um, we have no intention of changing it. I pretty much agree with Brett on all points here. There are two problems with a 16-ounce shaker pint. The first is that it's nearly impossible for a casual drinker to glance at a shaker pint and tell whether it's 14 or 16 ounces. The second is that a 16-ounce glass does not deliver a 16-ounce pour, which is in keeping with the spirit of calling a particular measure a "pint." I've don't ding pubs that don't use honest pints--the project has never been about being a beer cop. I wanted to encourage pubs to make the switch to a higher standard. And at least in the Portland area, we're seeing some nice success. Several places have switched over, and it is increasingly common to see not only larger glasses, but glasses etched with a line marking the pint level. I don't begrudge Rogue anything here, and I hope they don't begrudge the HPP. They're sticking to their guns, and I'm sticking to mine. Hoegaarden in protest at AB InBev's plan to cut a net 263 jobs out of its 2,700 Belgian workforce. InBev Belgium, which has a 57 percent share of the Belgian beer market, has said it risks running out of raw materials soon. Barrels and cases of beer have been piling up. Far out. Can you imagine a fight over 263 jobs crippling a multi-billion dollar industry in the US? A little over a year ago, Bend's Wildfire Brewery agreed to change its name after a restaurant chain threatened them with a lawsuit. In an inexplicable move, they decided to change the name to 10 Barrel Brewing, which is sort of like naming your dog "Dog." But everyone makes mistakes. If the rest of the brewery's beers are as good as the two I tried last week, I'm happy they spent their blunder-chit on the name. 10 Barrel was founded just over three years ago as a production brewery and its beers have made regular appearances in Portland and in fests around the state. Business must be good, too, because they decided this fall to add a taproom to the brewery. (Appare ntly they have scores of tap handles around Portland, but I have somehow never had a pint.) They're also bottling, as you can see from the pic, and it was in this form that I sampled Sinistor (which the brewery spells in a cutesy manner I won't replicate) and Apocalypse IPA. Sinistor scored a major coup last year when it took a bronze in the out-of-category category at the GABF (the one that earned Widmer a gold for Pitch Black IPA). This beer is a effectively a schwarz ale. It is light and mild, with a malt and hop profile characteristic of a schwarz. It has a touch of roasty malt that has notes of raisins and a bit of hop spice for interest. But rather than a dry, clean lager, it's a fruity ale. This give it a touch of body, but also lots of sweet. It's easy-drinking, but I was finding it to be a hair cloying by the end, particularly as the glass had gained a few degrees. Tasty session, but I wouldn't mind a hop or two more just to offset the ale. Call it a solid B on the ratings scale. The overwhelming ubiquity of IPAs means that they have to be more than good. To stand out in a crowd, they have to be distinctive. There are a couple ways to accomplish this, but the style is a showcase for hops, and this is where the opportunity lies. To build a better IPA, create a unique hop profile. Apocalypse is such an IPA. It is totally distinctive--though perhaps not immediately so. It's a beautiful golden-orange, and the nose is mainly piney, with possibly a hint of grapefruit. So far, this is familiar (though promising). But then you get to the flavor, and here's where things get interesting. I found three distinct elements--a fruity sweet malt body, an insistent piney hopping, and a citrus-juice note. When they come together, they create a fourth quality--a lovely tropical fruit melange. It's a bit orange, a bit mango, and possibly even a bit passionfruit. The bitterness isn't aggressive, but the hop flavors are saturated, and you really find yourself pausing to swish and consider them. Eventually, the hops do collect stickily on the tongue, but it's not a particularly sharp IPA. One of the nicer beers in recent memory, and one I'll track down when I can. Seek it out. I'll call it an A- on the ratings scale, but I may revise it up later. At long last, I've updated the blogroll and added over six months of beer, brewery, and festival reviews to the archived links at right. Holler if I've missed anything. Look alert, and any visit to a pub is a potential blog post. But few offer the fascinating details from last night's visit to Lompoc 5th Quadrant. Consider this the first award in 2010 for best service. Our friend Charlie arrived via bike (tres Portlandish, since it was spitting spiteful rain) and therefore arrived earlier to the pub and therefore arrived at the bottom of his IPA first. The waitress walked by, looked at his empty and said, "Another IPA?" He concurred, and she plopped one down off her serving tray. Mind-reading! I henceforth expect this of all pubs. Two of the seasonals are an imperial stout and a barleywine. A marginal .3% alcohol separate them--8.9% for the stout, 9.2% for the barleywine. Yet only one was served in a small glass. The mind-reading waitress could shed no light on why this might be, but was as amused as I was. I went with the stout ... in a 10-ounce glass. My age--a day shy of my 42nd birthday--now figures into these decisions. When all else fails, there's the beer to observe. The imperial stout was a fine pour. Made with coffee, it was rich and bitter and very boozy. Much admired around the table. Oh, and the Jets upset the Chargers while we were there, but I ignored this spectacle. Who cares about football? I mean, since the Packers got beat last week. On his blog, Patrick Emerson praises the arrival of Red Chair in 12-ounce bottles, but is mystified. Why is it so much cheaper when it arrives in regular bottles than the 22-ounce release? Estimates exist of scale economies in brewing overall (i.e. the size for the brewery), but I wonder if any beer geeks can enlighten me about scale economies when it comes to producing a particular beer? It seems to me that this must be a big part of the story. I'd be interested in the answer to this, too. I did pick up some interesting, related info yesterday at a private fete hosted by the Widmer Brothers. (And it was literally hosted by them, not the company.) They were buttering up the press on the occasion of W '10's release with good food, good conversation, and good beer. Fortunately, I had already gotten my review in, so I was able to enjoy the event without fear of losing perspective. In any case, at one point the brothers and a part of the brewing corps (numbering a dozen or so) stood up to take questions. An interesting conversational thread emerged when someone observed that this kick-off event seemed to follow the kick-off of the beer. The reason had to do with the success of this year's Brrr. Long before a seasonal beer is ready to be shipped, a brewery has to make decisions about how much to brew. They order the corresponding number of six-pack containers, labels, and so on, and then make the beer. If it sells very well, there's no time to get another batch in the pipeline--they just can't turn the battleship around that fast. So, in this case, they had to move the Pitch Black IPA up two weeks. If they hadn't grocery stores would have an empty slot on their shelves, and this is apparently a big problem for everyone. On a related point (one that strays, however, yet further afield from Patrick's query), the W series has been a fascinating test of the brewery's ability to predict successful beers. Of the six years they've been doing it, three have become regular beers--Broken Halo ('05 IPA), Brrr ('06 Hoppy Red Ale), Drifter ('07 Pale Ale). But the other two weren't great sellers. I asked if they felt like this was helping them get a sense of the market. Now, keep in mind that this is a brewery that has been around for 25 years and releases a bunch of beers every year--hundreds since they started. Answer? No, they have no idea. Selling beer is witchy business, and you never know what's going to sell. I have been a little neglectful about mentioning some developments in and around the beer-o-sphere, so it's time to do some catch-up. John Foyston has been writing about beer for the Oregonian since the mid 1990s, which surely must make him one of the longest-tenured beer writer in the country. But as you may have heard, all is not well with the newspaper business. In the latest round of cutbacks and employee buyouts, John decided it was time to make a change. He left the protection of a regular payroll for the fun and adventure of freelancing (joy! ), but it comes with some definite perks. One is that he can spend a little more time on one of his loves, painting. (Others include: motorcycle repair, rock n' roll, dive bars.) 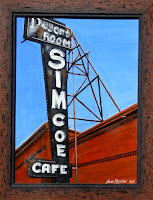 This weekend he unveils 15 of his works at Roots (a pub--where else would he have a show? ), and your should stop by, grab a pint, and have a look. John will be around from 4-8 so you can say howdy. Bill alerts us to a couple more new blogs to which I will re-alert you. First off, Renaissance Man Dave Seldon (artist, tech maven, homebrewer, entrepreneur) has launched 999 beers, a marathon project to taste a beer a day for 985 more days. Godspeed, man. Another new member of the International Brotherhood of Beer Bloggers (local 503) is Brady Walen's The Daily Pull. He has come out of the gate strong, with lots of in-depth commentary and reportage. Stop by and chat? I think I will. More when I know it. Kendall Jones has a very nice post at the Washington Beer Blog. It illustrates at least one of the key differences between the two states of the Pacific Northwest. We drink local. Washington, ever more worldly and cosmopolitan, less so. Here is a depressing fact that many people don’t know. In Washington, Washington-brewed craft beer is fourth in terms of sales. According to Heather McClung (President of the Washington Brewers Guild), California, Colorado, Oregon and Alaska all sell more beer in Washington than our local producers. (I admit, I’m not sure of the order.) How, you may ask, can that be? Instead of thinking of it as four states, think of it as four beers: Sierra Nevada Pale Ale, New Belgium Fat Tire, Deschutes Mirror Pond Pale Ale, and Alaskan Amber. We certainly are not as provincial as Oregon, where 11% of all beer consumed is produced in Oregon, but it is sad that Washington beer is in fourth place. I have been thinking about Northwest beer as I complete this book proposal. One of the great virtues of our state is that we are so parochial. I tend not to make a distinction between Oregon and Washington so much--as a region, our beers are pretty much of a piece--but I might feel differently if I lived north of the river and had to confront these stats. On the other hand, if you treated the two states as a single entity, I wonder if we wouldn't collectively drink mostly local beer? In any case, Washingtonians should get on the stick and head down to the local brewpub. And you should head over and read the full post. Last night a friend brought over a bottle of this year's vintage of the Abyss, and I grabbed a bottle of the '07 for a side-by-side. Mainly we were just shooting the breeze, but I have found that adding vintage specialty beers has its conversational virtues. Beer raters on BeerAdvocate currently consider this to be the third best beer on the planet, edged marginally by Westvleteren 12 and Pliny the Younger. (P liny the Elder, a superior beer, trails by just a hair more and is in fifth--but I digress.) It is a beer that always creates a furor at release, and I am fairly certain that you could trade older bottles of the Abyss for an older Camry on the gray market. All of which leaves me somewhat ambivalent: I am not an Abyss-head. I tried the first vintage green and found it undrinkably intense. The black malts were grinding in their bitterness and the overall presentation was just too rich. I've encountered some triple-chocolate cakes of a similar ilk--too much of a good thing. No worries, though--I put the bottles in the cellar and figured I'd wait it out. Indeed, on election night I revisited the '06 and with two years it had stewed quite a bit. Still intense, but the edges had mellowed and it came together. At Christmas we tried another bottle of the '06 (just one left!) and again, nice. So I wasn't surprised to find the '07 in fine form. After a couple years, the beer takes on just a plummy hint of oxidation (mainly an aromatic), and all the violence of the malts, bourbon, licorice have taken a step back, put down their weapons. They blend much more gracefully, and I found a lush dark chocolate character there, just on the good side of bitter. What really shocked me was the '09. It was far more drinkable than the '06--the last green Abyss I tried. The body is lighter, and a bright floral note somehow survived the process. You find it both in the nose and on the palate, unsullied by the motor-oil it inhabits. It's really a revelation, bringing out a kind of lavender flavor from the dark malts. Readily quaffable and not particularly agressive--at least by comparison. It's odd; I'm not sure I would even recommend aging this one (though of course I will). That fresh, delicate note won't survive bottle aging, and it's really something to behold. Deschutes made quite a bit more Abyss this year and you can still find it on shelves. You might appreciate grabbing a bottle and sampling it green. It gives me great pleasure to introduce the newest member of the officially-certified Honest Pint club: Full Sail Brewing. When you visit the pub at the brewery in Hood River, you will be served a pint in an elegant glass featuring the gold standard in honest pint transparency, an etched line marking a full pint. The Columbia River Gorge is quietly becoming one of the richest troves of good beer in all of Beervana. They take their beer seriously there, and I am delighted that one of the venerable giants of Oregon brewing now serves honest pints. If you haven't made a swing through recently, stop in and have a pint. "'Eat the food, Enkidu, it is the way one lives. Drink the beer, as is the custom of the land. he drank the beer--seven jugs!-- and became expansive and sang with joy!" Visitors to the Gilgamesh booth during the Oregon Food, Wine & Beer Festival’s opening day today were privy to three beer tastings — including the popular Black Mamba, a black tea and tangerine zest beer — from the young brewery based in Turner. [Nick] Radtke, his two brothers and father started the brewery about nine months ago, deciding to rely on 12 years’ brewing experience. “Eight or nine months ago we realized we were tired of the daily grind of our jobs and we decided to open a brewery,” Radtke said. Digging a bit deeper (the Google points me to both a website and Facebook page), you will find an eclectic list of beers, half of which eschew hops for other herbal infusions: Black Mamba (no hops), Copper (traditional amber), IPA (traditional, but with an intriguing mixture of Amarillo, Simcoe and Zeus), Hopscotch (traditional Scottish ale, and surprisingly their most popular), Cranberry Saison (obviously nontraditional--brewed with local cranberries and no hops), and Chocolate Mint Stout (local mint and Moonstruck chocolate Amano chocolate nibs). In case my own year-end wrap-up wasn't adequate (and to be honest, it wasn't particularly comprehensive), you might appreciate a couple others. First is John Foyston's, which appeared in the A&E this morning. His is comprehensive and idiosyncratic. Then there's Jon Abernathy's, which, appropriate to a blog, is more personal. And don't miss Brewpublic's long piece on forthcoming Mt. Tabor Brewing. Among those businesses was Widmer Brothers Brewing Co., 929 N. Russell St. Co-owner Rob Widmer said the brewery lost 250 barrels, or the equivalent of 62,000 pints, of Deadlift Imperial IPA, a new brew and its most expensive beer, because of the outage. Okay, 250 barrels? That's one king-hell lot of beer. That's a quarter of what an average-sized brewpub might produce in a year. To have to dump that much from a lost batch--to be able to dump that much--demonstrates just how big Widmer has gotten. Somehow comparing annual barrelage doesn't grab me the way hearing this news did. Oregon continues to buck the national trend by opening new breweries from the Caldera Brewpub in Ashland to Mt. Emily Alehouse in La Grande and Mutiny Brewing in Joseph. The market for craft beer in Oregon is four times as strong as the national average, boosting an industry with more than 5,000 jobs. Portland leads the nation in urban brewpubs, with more than 40 and counting. Most other states have experienced a net loss of brewpubs during the recession, but Oregon has gained several dozen including, I am thrilled to report, two soon to open within walking distance of my home. After finding myself in the doldrums of the holidays, it's good to finds some new beers awaiting me on the other side. 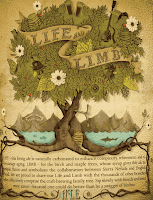 I had a chance to try two much-anticipated releases in the past week--Widmer's GABF gold-medal winning black IPA W '10 and Life and Limb, a collaborative beer from Sierra Nevada and Dogfish Head. Let's start with the home-town team. The "W" series has turned out to be one of the bigger successes in Widmer's history--at least from a beer perspective. From it they have gotten two standards, Drifter and Brrr, and with this year's offering, a gold medal. And, if the whole black IPA has any legs at all, another beer for the regular rotation. Let us stipulate here at the top: I don't like black IPAs. I find the combo psychically disconcerting, as if discovering that Rush Limbaugh suddenly became a PETA-loving vegan. The mixture of black malts and clean, crisp hopping confuse me, never mind the syntactical dischord of a "black pale." And so, while I'm about to rave about this beer, my opinion of the style hasn't changed. I will not drink a lot of this beer in the future, but that doesn't mean I can't appreciate and admire it. The difficulty in making a black pale is trying to find harmony amid clashing elements--hops and black malts. Trickery can overcome the paradox--you can darken an IPA so that it looks visually black but contains none (or few) of the flavor notes of dark malts. But to make the two work together is the real trick, and one Widmer pulled off. The bridge comes by using hops that approximate pine tar. They're bright and clean, but they hold hands nicely with the cocoa-bitter dark malts. (I'd love to tell you which malts were used, but Widmer's website is currently doing a hinky timeout thing.) This allows both elements of the beer to express their true natures while managing to occupy the same glass. (More reviews at Ezra's new joint.) If you're at all interested in this style, buy a sixer. But if you're like me, also feel free to let the phenomenon build without your participation. I feel compelled to offer this beer at least an A- on the ratings scale, and I wouldn't be surprised to see it become the standard, at least locally. 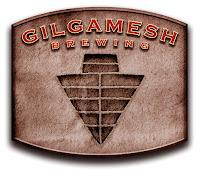 It bears mentioning that the Widmers have dealt a blow the cause to popularize the "Cascadian Dark Ale" style. Instead of calling this beer by that name on the label, they have gone with "Black IPA." Whether this beer actually qualifies as a Cascadian Dark Ale is another matter (sometimes the distintion is lost on me), but if Widmer ends up with a big hit, Black IPA may blot out the sun as far as nomenclature goes, leaving Cascadian Dark Ale as a cool coulda-been. This is one of those beers that looks fantastic on paper. Sam Calagione tapped some maple syrup from the home farm in Massachusetts and Sierra Nevada contributed their own barley to make a 10% old ale fermented with yeast from both breweries and bottle-conditioned with birch syrup. Definitely a high-concept beer from two of the most-beloved craft breweries in the country. I started homebrewing back in 1993, when my palate was young and crude. Within a few batches, I was regularly making beer that met my own low standards. In the intervening decades, my palate has refined a lot more quickly than my homebrewing skills. A particular segment of my ouvre involves big beers that are like streotyped football players--strong, coarse, dumb, but affable and polite. Old ales, imperial stouts, strong ales--they tend to turn out pleasant, drinkable, but amateurish. When I cracked Life and Limb, I encountered a beer very much like my own homebrew. I therefore enjoyed it, but as with my homebrew, I'm not fooled--it's not a fully successful experiment. Life and Limb is a very sweet, sticky beer. I would call it an old ale, though it's a bit on the strong side for that style. Sweet stickiness is okay for an old ale, as are the additions of syrup. The problem is that the flavors overwhelm each other and result in a muddled, indistinct palate. Caramel and maple notes are here, but it's just too sweet and despite the 10% strength, nothing balances them. They crash together with the treacly malt in the mouth leaving you with just a general sense of sweetness. It's hard to get through even a half bottle and you feel like you need a pint of water afterward. I wouldn't be surprised to learn that in a year's time this beer has improved markedly--but if so, I wonder why it was released so green. Not a catastrophe, but at $10 a bottle, definitely nothing you have to feel about missing. I'd give it a C+ on the ratings scale. All right ladies and gentlemen, start your engines. The pole positions have been decided and the yeast selected, and now it's time to start brewing! Cheers to Belgian Beers is just a few months away. This strain produces complex esters balanced with earthy/spicy notes. Slightly tart and dry with a peppery finish. A perfect strain for farmhouse ales and saisons. Although the strain is tolerant of high temperatures, it's not Dupont's strain, and brewers won't have to go for the extreme heat. Well, not exactly Dupont's. Rather, this is apparently Brasserie Blaugies' strain, but they originally used Dupont's. So make of that what you will. The good news is that saison strains are versatile and should be able to make everything from very small beers (grisette, anyone?) to huge bruisers with relative ease. Last night, breweries tossed darts to find out which "quadrant" they'd be brewing, and that list is at the OBG website. Go have a look to see what your favorite brewery is whipping up. Oh, and homebrewers, take note: you can also compete in a homebrew competition with the same yeast. The details are also available at the OBG website (scroll down). We are predators. This impulse, embedded deep in the most primitive reaches of our lizard brains, is ancient and mostly unused. We do not have to rely on this hardwiring when we stop by the meat counter at the grocery store (or tofu aisle). And yet it's there, waiting to guide us. Avid fans of anything (WWII memorabilia, cars, beanie babies) know the experience of the hunt. Not for wildebeest, but for the elusive ephemera needed to round out a collection. Beer geeks are no less avid, and we can occasionally stoke our predator lizard brain with a hunt for the obscure. Last night, much by chance, I happened to discover, finally, long after I thought all hope was lost, a tap with Collaborator CXI, that pumpernickel-bread beer I have been seeking. With a spare hour of free time, I stopped into Belmont Station last night and there it was. Belmont is currently hosting its Bigger, Badder, Blacker beer week, and there are a lot of great pours to be had: the Abyss, Chocolate Oak-Aged Yeti (the night's buzz beer), Life and Limb, Velvet Merkin, etc. But it was the Collaborator, along with that rush of excitement at a found object, for me. In a case like this, it hardly matters how good the beer is. And yet, as an added bonus, the beer was exceptional. It was served, in the Belmont fashion, in a tulip glass--perfect to capture the complex aroma coming off the beer. Pumpernickel bread loaves were added to the mash, and the aroma is oven-fresh, yet not so much of bread. Cake, perhaps, and chocolate and a touch of evergreen. The sensuous body is creamy and frothy--retaining a nice skiff of head to the last drop. The flavors are like the aroma, a quarter turn left of expectations. It's a dark, earthy beer, with spicy, herbal notes. The rye comes through as peppery-minty, but is subtle enough that it hangs behind the more expected nutty, chocolatey first notes. A big beer at 8.5%, with the requisite warming but no sharp edges. One of the best beers I've had in recent memory, and I wish it was easier to make and likely to be seen again. But, since it's not, I have at least the consolation of knowing that at least my lizard brain will keep its memory close, waiting for a chance to strike again. Sometime this month, Deschutes will release Red Chair Northwest Pale Ale, which is I believe a renamed version of Red Chair IPA. (Anyway, the strength and bitterness--6.4%/55 IBU--are identical.) Side note: don't look for it at your local grocer, however; it appears only outside the Northwest in January. Here we'll be receiving Cinder Cone--perhaps my least fave of the Deschutes line--in its swan song and last-ever bottling. When it runs its course, then we'll get Red Chair. Yet the thing that interests me is not so much Red Chair as the style description: Northwest pale ale. It happens to coincide with a batch of homebrew a friend of mine made that he styles a Northwest best bitter. And let us not forget the effort to popularize a black IPA variant locals are trying to dub "Cascadian dark ale" (two versions of which--Hopworks, returning on tap today, and Widmer W '10--are currently available) nor the emergent Big NW Red. Something's afoot. In viticulture, "appellation" is a geographic designation for a region where grapes are grown. The sense of place is everything for a wine--the geography, the climate, the terroir. A pinot grape grown in the Dundee Hills (AVA 2005) will taste different than one grown in the Santa Maria Valley (APA 1981). Legal matters have strained the elegance of the system (can't call a sparkling wine Champagne if it's made outside France? ), but it is useful nevertheless. Beer is less finicky about place. Many of the classic styles were once products of the local environment (water quality, hop variety and availability, local adjuncts), but now brewers can fiddle with the elements and achieve a minerally pale ale even with soft, pure Oregon water. 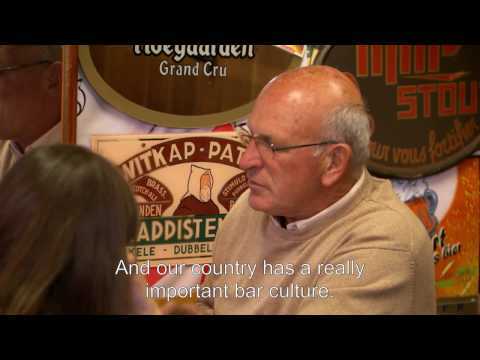 Yet styles do emerge when locals demand certain qualities in a beer. General themes have emerged: on the West Coast, we love our hops and we strongly favor ales. In New England, they like a proper, balanced pint. The Midwest is a bit schizophrenic, but they do appreciate a nice lager far more than we do. But can we start talking about a "Northwest" style? I'm on the fence. On the one hand, "West Coast" seems an adequate description of most of the things you might otherwise call "Northwest." (I'll quickly concede that West Coast beers are distinct from those brewed elsewhere.) The general features: bigger than usual, fruitier, characterized by zesty American hops, and more bitter. On the other hand, there do seem to be subtle differences. Northwesterners aren't as focused on purely bitter beers as they are on hoppy beers. They want as much aroma and flavor as bitterness. In fact, I think most in the Northwest have moved beyond beer that features only punishing bitterness. While that may be present, if it isn't rich with aroma and hop flavor, Northwesterners will dismiss it as a lesser beer. Conversely, even bitterheads admire an ale of moderate hopping (say 40 BUs) that is saturated with flavor and aroma. Apply the proclivity more broadly, and I guess you could say that it is characteristic of the Northwest to try to infuse beer with hoppy goodness. Generally this means bittering it up some, but not exclusively. I am reminded of Double Mountain's exquisite Kolsch--a beer that is both too hoppy to be called traditional, yet also one that tries hard to stay true to the spirit of Cologne's famous style. A Northwest kolsch. Hmm, possibly. I don't know. Your thoughts? Some of you may have been readers of Jeff Bell's blog (aka "Stonch"). He was sort of a gonzo blogger back in the day--but then he bought a pub in London and the writing became less gonzo-y. Well, now he's shutting it down altogether. It was a nice run, Jeff. Welcome, Ezra, to the international brotherhood of beer bloggers, Portland local 503. May you flourish and battle your nemesis entertainingly. Update. In comments, regular commenter Jason notes that he has also joined the brotherhood. I will (eventually) update the blogroll accordingly. If you look to the left column, you will see a small gray box that says "advertise on this blog." Look down the page and you'll see that Google Ads are gone. I'm trying something new: Blogads. In order to recoup some of my time on this blog, advertising seems like a decent way to go (and Adsense isn't getting it done). Moreover, in about two weeks, the federal grant that has paid my salary for the past five years comes to an end and I join the ranks of the unemployed--and I have to figure a way to avoid resorting to Pabst. Like Google's Adsense, Blogads have an important virtue. I won't be selling the space--anyone can go buy a week, and I won't know until it appears. I won't be selling ads and I won't be doing any kind of quid pro quo. You might see a Budweiser ad, for all I know. (I do have the option of rejecting an ad I find inappropriate or offensive.) On the politics side of things, I know that Blogads are often sold to people advertising for the opposite team, so for example, you might see an ad for Sarah Palin's book on a liberal site. This often enrages the readers, but it's actually a very good thing. By removing myself from the ad side, I maintain the same relationship to breweries I've always had. The advertisers (should there be any--and I hope there are!) will be Blogad's clients, not mine. I do hope you consider advertising on the site. My traffic's not amazing, but I do have a perfectly-targeted audience of beer geeks. Trying to raise your brewery's profile, promoting new releases or events--this is a good site to find eyes interested in that info. I have no idea what a competitive price is, so I'm starting it out at $15 a week, which doesn't seem bad. The price of three pints (or a couple six-packs) is all it will set you back. 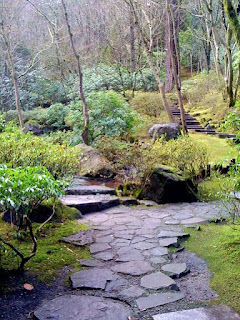 Feeling cooped up after a long period of indoor socializing, we went to the Japanese Garden yesterday. Wonderful. More out than down, actually. Expect little activity through the weekend. Not a lot to blog about, and I also need a brief period of battery-recharge. See you Monday.